In Los Angeles today, all eyes will be on Nipsey Hussle’s memorial service. The funeral is expected to draw several thousands of mourners on the streets of L.A., where the funeral procession will do a 20- to 25-mile “Victory Lap” through the communities Nipsey advocated so fiercely for. The 21,000-seat Staples Center, where the rapper’s memorial service will be held, will also be filled to capacity. Complimentary tickets for Nipsey’s “Celebration of Life” were sold out within minutes. The last time the Staples Center was used for a memorial service was for Michael Jackson in 2009, CNN reports. The service is scheduled to begin at 10 a.m. PDT/1 p.m. EDT; BET will broadcast the homegoing for the slain rapper and community advocate live online, on its Facebook page, and on TV. The music streaming platform Tidal announced on Wednesday that it will also stream the memorial to all, (yes, including non-subscribers). Nipsey’s body will be interred at Forest Lawn Memorial park following the service. Born Ermias Asghedom, the Eritrean-American rapper’s death has profoundly affected artists and fans across the country. A widely respected advocate and entrepreneur, Nipsey frequently spoke about the importance of investing in and preserving black communities. Nipsey’s family and loved ones, including girlfriend Lauren London, are expected to attend, as are prominent members of L.A.’s hip hop community. The 33-year-old was gunned down on March 31 outside of his Marathon Clothing store in South L.A. On Tuesday, Los Angeles City Councilman Marqueece Harris-Dawson announced the intersection of Crenshaw Boulevard and West Slauson Avenue will be named Ermias “Nipsey Hussle” Asghedom Square to commemorate the artist and advocate. Offering words of encouragement to Nipsey’s fans this week, his mother, Angelique Smith said she is at peace with her son’s death. Updated Thursday, April 11 at 1:58 pm EDT: Nipsey Hussle’s memorial service was considerably delayed Thursday morning, with the service yet to start by 11 a.m. local time in Los Angeles. Among those arriving at the Staples Center to pay their respects was Snoop Dogg. 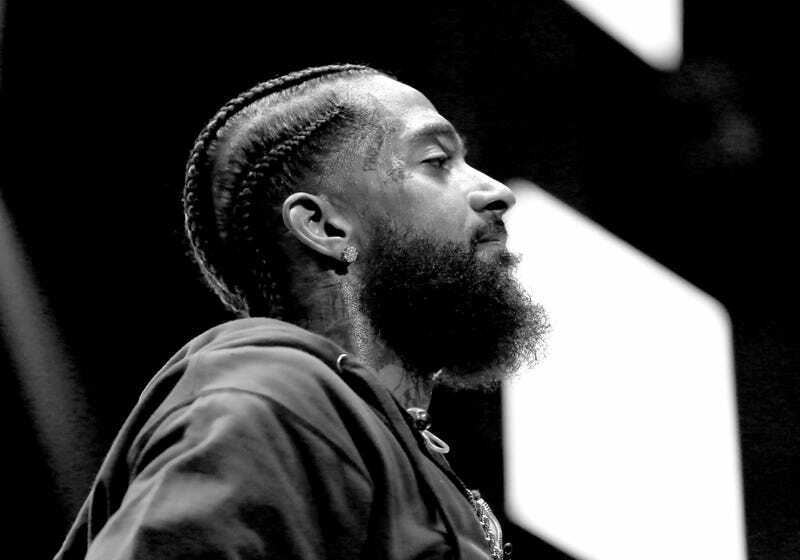 Stevie Wonder, Jhene Aiko, Anthony Hamilton, and Marsha Ambrosius are among the scheduled performers for the celebration of Nipsey’s life.